Need more information about booking Home 8608823 ? 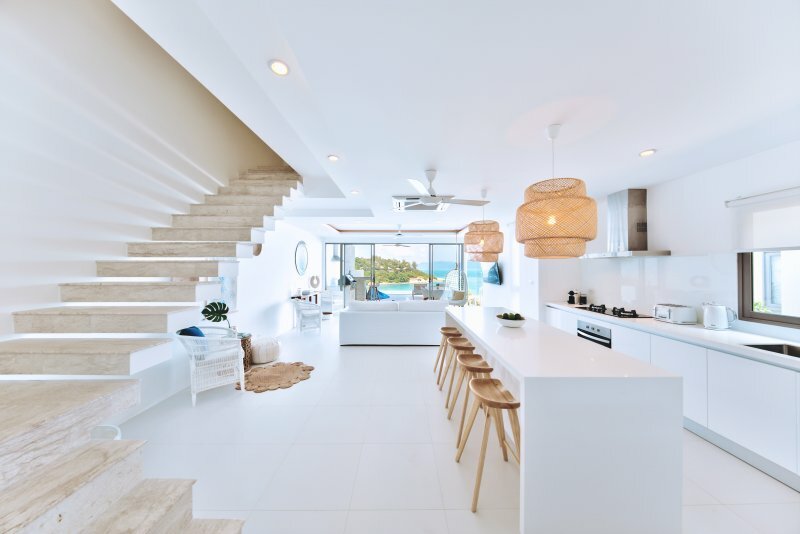 This Brand New Villa - White Palm I - is a stunning Beachside Villa with private Infinity Pool offering Unparalleled Views of the Gulf of Thailand and Surrounding Islands. Designed for families and small groups who want to experience five star accommodation with all the conveniences of villa living. Steps away from White Palm are the white sands of the secluded Samrong Beach shared with the prestigious award winning Six Senses 5 star Resort and Spa with their bars, restaurants and spa a stroll away. Set on the exclusive northeast coast of the Island on a private hillside cove this exclusive neighbourhood offers night time security, private road access with street lighting and landscaped gardens, with White Palm enjoying a beachside forefront position at the bottom of the hillside neighbourhood. Hidden from the main tourist track but a mere 10-15 minute ride to almost everywhere you cannot find a better location on Ko Samui. The airport is a 10 minute drive. The villa’s modern and chic interiors have been created to sooth and relax and allows for the vibrant greens and blues of the surrounding trees and water to be the stars. With Four immaculate designer bedrooms that accommodate up to eight guests. Master Bedroom: King Size Bed, En-Suite with rain shower, upper balcony, large dressing and vanity area. ​Bedroom 4: King size bed, En-suite with rain shower, a small private patio within landscaped gardens. We wish to inform you that for all stay's before November 31st 2017 they will be finishing the shore line villas below US, directly opposite Six Senses Resort & Spa, this is something we would like to make you aware of as our valuable guest but we believe does not adversely effect your stay. We welcome you to enjoy these truly incredible prices whilst we 'launch' WHITE PALM and be one of the first to enjoy a new standard of villa living. This price quoted is for up to 6 Adults and 2 Children. As we welcome many smaller we believe this price makes it fairer. For guests numbers above 6 Adults - up to 8 adults maximum we add USD 30 per night. We believe this offers incredible value for money at such quality. You can book direct with the villa owner. Our On-Site villa manager will welcome you at the villa and give you a full house orientation. Should you need support whilst there you will be able to call or email us for assistance. Our aim is to provide you with all you need for complete relaxation and support you with everything you may need to make magical memories with friends and loved one whilst on the beautiful Island of Ko Samui. Before you travel a complete Villa and Area guide is sent to you electronically so you can read up and indulge before you arrive. This includes tips for getting 4G Mobile Phone Connectivity, Restaurants, Night Markets, Car Hire, Excursions, Boat Hire, Maps, Golf Courses, Travel Tips and More..
· Check-in time is 15:00 hours and Check-out time is 11:00 hours. user. Charged at 1Kw = 7 Bt. · The villa is none smoking - Smoking is allowed outside. · A $500 refundable deposit is required on arrival to cover any damages or loses at the villa. This is to protect the guest experience for you and all our valuable guests. You'll need to send Claire (the owner) an enquiry to book - the owner will let you know how to pay. If they accept online booking they'll send you a quote and info on how to pay. If you pay through our website you’ll be covered by Payment Protection. Or you can send Claire (the owner) an enquiry through the contact form to request a quote. Claire (the owner) will email you the total cost for your dates and how to pay. Send Claire (the owner) an enquiry through the contact form requesting a quote for your holiday dates. Claire (the owner) will email you the total cost for your dates and how to pay. Claire (the owner) of this property is responsible for taking and refunding your damage deposit. The damage deposit terms should be agreed before booking and outlined in the booking contract, if Claire (the owner) supplies one. Please refer to these details or contact Claire (the owner) directly if you have any questions. You'll need to contact Claire (the owner) to cancel. They should have provided their contact details when you made your booking - otherwise, email them through the contact form. You'll need to contact Claire (the owner) to edit your booking. They should have provided their contact details when you made your booking - otherwise, email them through the contact form.